NETWORK FINALS: ABC’s NBA PLAYOFFS game gained half a point in final numbers, putting it up to 2.0, while NBC’s NHL PLAYOFFS game rose 0.3 to 1.2. In addition, the CRIMINAL MINDS rerun on CBS lost 0.1. CABLE HIGHLIGHTS: The NBA PLAYOFFS topped Saturday cable as well, although ESPN’s coverage of the Toronto vs. Miami game was lower than midweek games have been at 0.89. Fox Sports 1’s NASCAR coverage was behind basketball at 0.67. On Adult Swim, the late-night animated line-up was as follows: DRAGON BALL Z up 0.03 to 0.67/1.37M, DIMENSION W up 0.05 to 0.60, HUNTER X HUNTER up 0.07 to 0.54/1.057M, SAMURAI CHAMPLOO up 0.04 to 0.48/963K, NARUTO down 0.01 to 0.41/863K, ONE PIECE up 0.01 to 0.36/746K, and PARASYTE steady at 0.32/657K. 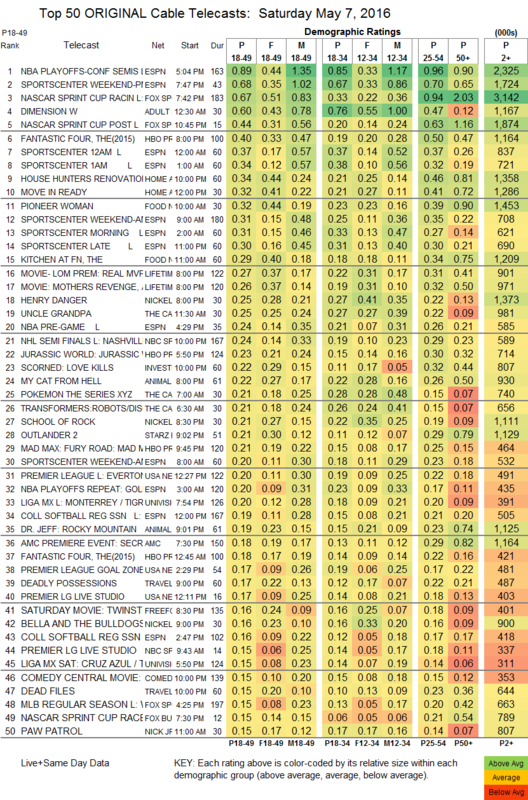 HGTV’s HOUSE HUNTERS RENOVATION slipped 0.04 to 0.34, and a noon MOVE IN READY also hit the Top 10 at 0.32. Food Network’s PIONEER WOMAN rose 0.04 to 0.32, and KITCHEN AT FN held at 0.29. Lifetime’s REAL MVP movie was at 0.27. Starz’s OUTLANDER took a 0.06 hit to 0.21.